No history of The Lambs ® would be complete without reference to the Club’s charitable work and its response to the entertainment community needs, whereas mention must be made to the Percy Williams’ Home, Winchell Smith, and The Lambs Foundation. Percy Williams, once the treasurer of The Lambs, is remembered for his great generosity. By his request, the handsome Williams Estate in East Islip, Long Island, along with ample funds to maintain it, was established as a Home for actors and actresses in advanced years. Terms of his will required that six members of The Lambs and six members of the Actors’ Fund of America be elected to supervise the operation of the Home. Eventually the home merged in The Actors’ Fund of America. Winchell Smith, nephew of the eminent actor and author William Gillette, was himself a successful actor, playwright and producer. In the latter field he was long associated with the late John Golden (an Immortal Lamb). At his death in 1933 it was disclosed that Smith had left a lasting memorial to his name, as well as a perpetual source of benevolence to his fellow Lambs, the Winchell Smith Trust Fund. Learn more about Winchell Smith. The Lambs Foundation was formed in 1943 as a charity organized under the laws of the State of New York (originally called The Lambs Servicemen Morale Corps, then later The Lambs Relief Foundation). Supported by donations, it dispensed funds for the benefit of needy, sick or destitute members of the entertainment profession. By action of the 1961-62 Board the corporate name was changed to The Lambs Foundation, and its purview was expanded to include the support of theatrical organizations, education in the arts, development of new works of theater and emerging talent. 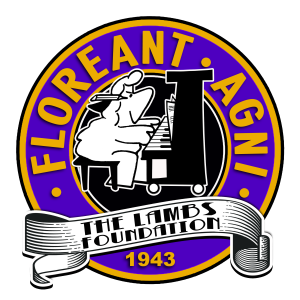 The Lambs Foundation is very active today, supported in part by a bequest by Frederick Loewe’s estate, and by various private donations and bequests, and manned by an all-volunteer staff. The Foundation benefits many theatrical charities, educational programs and non-profit theatre companies. The Lambs Foundation had helped an effort to launch a production of a lost Marx Brother’s musical, “I’ll Say She Is,” by hosting a presentation of excerpts followed by a discussion of the work behind the research and restoration of this comedy. In 1992 The Lambs Foundation was recognized for its work with a Jack Dempsey Humanitarian Award from St. Clare’s Hospital and Health Center in New York City. A chair in the National Theater, Washington DC, commemorates our Foundation, as does a chair and plaque at the SAG-AFTRA Foundation Robin Williams Center in New York. In 2017 we began the Scott Glascock Scholarship in cooperation with the New York campus of the American Musical & Dramatic Academy (AMDA). The list of beneficiaries is many and may be found HERE. The Lambs Foundation, in recognition to a 105-year history with Actors’ Equity Association, has committed to long-term support to the Actors’ Equity Foundation‘s member education programs. Known as The Lambs Foundation Glascock Grant, in recognition for the generous bequest of Lamb – and AEA Member – Scott Glascock. For more information please contact us at (212) 586-0306, or e-mail us. The Lambs Foundation gladly accepts donations, which are fully tax-deductible as provided by law (please check with your tax advisor), not only for continuing its mission, but for the restoration of its archives and art work. Persons may ‘adopt’ a painting by accepting the cost of its restoration, and a plaque honoring their donation will be placed near that painting. Consider a donation! The Lambs Foundation is not connected in any way to other similarly named charities, such as ‘Friends of the Lambs’, or ‘The Lamb Foundation’; The Lambs Foundation, Inc., was formed in 1943 in New York State and is recognized as a 501(c)(3) Non profit organization. Donations are appreciated and considered tax deductible as provided by law. Please check with your own tax advisor. Read More.